This is very like the previous pendant, but I guess I like this simple style. I just need to make more of the silver frames, which are very simple to do (at least now, after five, they are! ), for the other tiles. 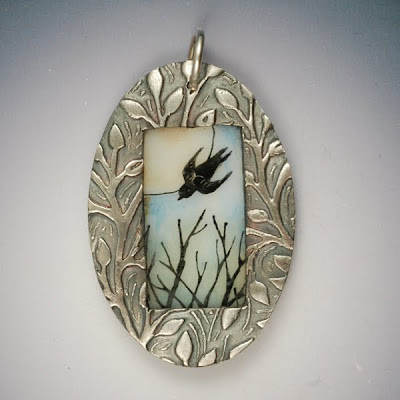 This is the class sample for my workshop at Blue Moon Glassworks on October 31, 2009. If you're near Austin, come join us for some spooky fun. Maybe I'll have to make a Halloween version, hmmm? you will surely have fun at Blue Moon Glassworks and the frame is just perfect, love it. Ah, this was my favorite window of the group- love what you're doing! ooh, that came out soooo lovely. how big is the pendant? ah ha! this is the one i really like! Nice work!